Old Favorites: Reread charts/poems from previous stories. Ask students to share their experiences with trains. Have they ever seen a train? Have they ever rode on a train? Where? What type of train was it? What sounds do trains make? How do trains move? How would you describe a train? What is the red engine carrying? Where is it going? What do you think the red engine should do? Could the train load of toys really help the red engine? How could another train help the red engine? Do you think the shiny engine will help? Why didn't the shiny engine help? What was it already carrying? Why didn't the black engine help? What was it already carrying? Do you think the little blue engine will stop and help? Why or why not? Do you think the little blue engine will be able to make it over the mountain? What did we learn about the little blue engine? What events in this story could happen in real life? Which events in this story do we know are made up and not real? Brainstorm with students some different things that trains could carry. Next, ask them to consider what color each of those items would be. Tell students that throughout the week, they are going to work on making an ABC color train! Each student can contribute one sentence and train car. Write each sentence on chart paper, writing their name at the end of the sentence. 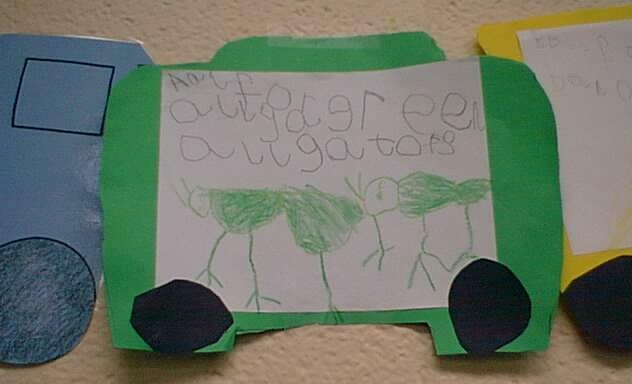 (For example, 'Aa is for green alligators.' (Alan) ) Let a few students each day share their sentences. Reread each sentence tracking the print. Ask students to share what they remember about yesterday's story; Reread The Little Engine That Could. Students will most likely want to chime in when the little blue engine says, "I think I can! I think I can!" Introduce the companion story Freight Train. 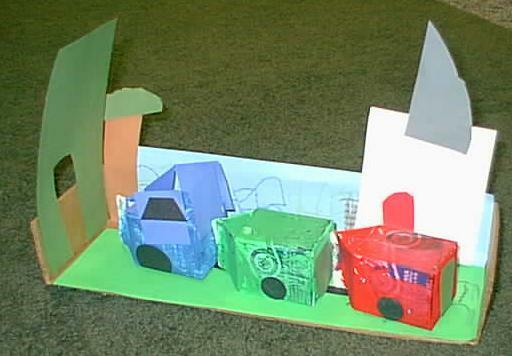 Take a picture walk, letting students share what they know about each train car pictured (color, name, contents, etc.). Read the story aloud for enjoyment. Reread the sentences from yesterday. Encourage a few more students to add to the predictable sentence char, continuing with the next letter of the alphabet. Review the focus story, The Little Engine That Could. Show students pictures from the story that are out of order. Let students look closely at each picture and describe what is happening. Encourage students to work together to place the pictures in order. As students place the pictures in order, discuss the beginning, middle, and end events. Also, let students determine what the problem in the story was as well as how the problem was solved. Reread Freight Train, pausing for students to fill in the appropriate color word. Reread all of the sentences contained on the chart from the previous days. Choose a few more students to think of an object that could go in our ABC color train. Write their responses, encouraging students to spell out loud the words 'is', 'for', and the color words. Introduce the title, author, and illustrator for another companion story called Clickety Clack. Read the story aloud. Ask students to think about what it would be like to be riding on the train with all of these creatures and to predict where they think the train is going. In the same manner as previous days, continue to reread and add the last few sentences onto your class ABC color train predictable chart. If you do not have enough students to complete your ABC train, work as a class to think of some items that start with the missing letters. Reread Clickety Clack, pausing to let students fill in the rhyming words and the 'clickety clack's. Next, write the word 'clack' on the board and tell students that they will be going on a rhyme hunt for other words that rhyme with 'clack.' Reread the story, page by page, and let students listen for rhyming words. Have students raise their hands when they hear a word that rhymes with 'clack'. Then, students can assist you in writing that word. (See photo below.) In this manner, your class will be 'Rounding Up the Rhymes'! 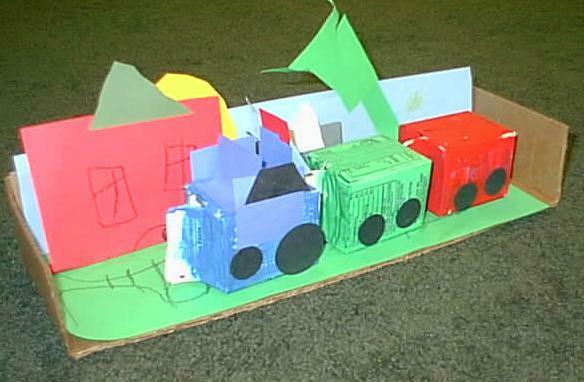 For individual practice with word family rhymes, let each student complete their own 'Word Family Train' booklet. (See below for photo and printables.) In the booklet, there are four word families, with three words from each word family. Students have to read the words on the train cars and then cut and glue the corresponding picture above each car. Note: You will still need the corresponding pictures! I found mine in Fun Phonics Manipulatives by Hancock, Pate, and VanHaelst, Scholastic, 1997 and cut and pasted to make sheets for each child. Reread Clickety Clack, encouraging students to join in on the reading; Give each child a train (You might want to use the ones they have made- See below under cross curricular connections, Art) and a small plastic animal. Ask students to set their animal at the beginning of he train, at the end of the train, and then in the middle of the train. Say a word and ask students to listen carefully to where they hear a certain sound. and then ask students to place their animal to the side of the train car where they hear that sound (beginning, middle, or end). Aa is for green alligators. 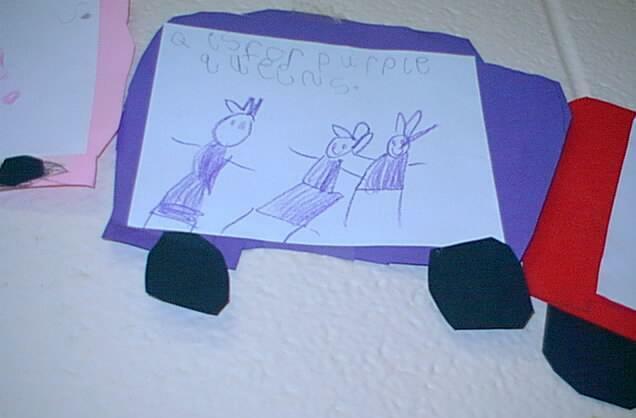 Qq is for purple queens. do you want your money back? All pulled behind the engine. All in front of the caboose…Toot! Toot! The train goes click, click, click! The whistle goes woo, woo!! These trains are made from painted milk cartons. Students attached pre-cut circles and squares for wheels and windows and then decorated the rest of the train and the background as they desired. 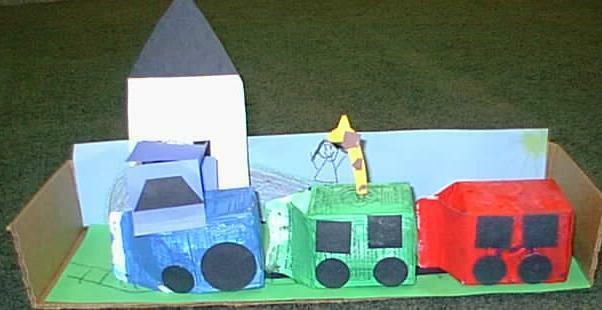 Most students added tracks, buildings, trees, etc. to their backgrounds. Some added tunnels, animals, etc. The background is just a box, left over from our school's pop delivery man, cut lengthwise. The three milk cartons are held together by a strip of black construction paper taped underneath the boxes. The students loved this project! Thanks to Judy Reed for the idea to add the background using the boxes.